The Windows print screen key will copy the complete screen to the Windows clipboard whenever it is pressed by the user. Many users install programs that give them more control over the screenshot taking process. Hardcopy is such a program. It is a lightweight application that adds several new features that make it easier to take screenshots in Windows. The default function of the print screen key remains the same. 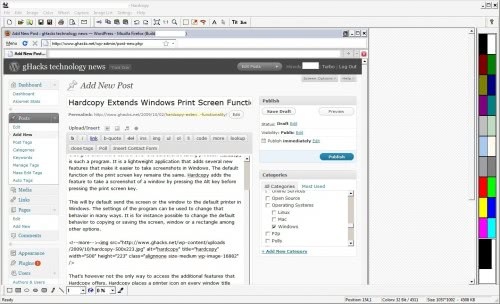 Hardcopy adds the feature to take a screenshot of a window by pressing the Alt key before pressing the print screen key. This will by default send the screen or the window to the default printer in Windows. The settings of the program can be used to change that behavior in many ways. It is for instance possible to change the default behavior to copying or saving the screen, window or a rectangle among other options. That's however not the only way to access the additional features that Hardcopy offers. Hardcopy places a printer icon on every window title which when pressed will also initiate the configured action. Three different actions can be configured that are triggered by pressing the left, middle and right mouse button. The main window of Hardcopy offers basic image editing options which can be useful to quickly edit the screenshot before publishing or sending it. Probably the most impressive feature of Hardcopy is the amount of computer memory that it needs to run. It uses less than 2 Megabytes of computer memory, usually even less than 1 Megabyte. Hardcopy is available for all Windows operating systems at the developer's website. The alt + printscreen feature is available by default…. is it possible to print out windows that need to be scrolled in order to see the entire window contents? I do not think that this option is supported by the program. Try Picpick – a superb application that is my favorite. It features a powerful capture tool, image editor, color picker, color palette, pixel ruler, protractor, crosshair, whiteboard etc. It can also capture scrolling windows and here’s the kicker…It’s FREE!! I like picpick, but i’m looking for something that uses as little resources as possible and i believe picpick is quite heavy in resource usage no? @Rage: PrintScr only copies an image of the screen to the Clipboard. This program (which I’ve used since around version 12, and haven’t updated since version 14) allows you to actually send it to the PRINTER, save it as a bitmap, or print/copy just a window. Nice program; you can also try Gadwin PrintScreen at http://www.gadwin.com/printscreen, another free program with a few less features. I use the portable Fast Stone Capture (FSCapture) which supports scrolling windows and has an editor too.